Hoe and Shovel: Plant It and It Will Grow! That's the plan right? Plant it and it will grow. It's a plan that works out better at times than other times in my garden! The climate has been good for steady growth here in Central Florida since January. Mild daytime temps with mercury dropping to a comfortable cool at night. I shared with y'all in a previous post the two new planting beds I created in January/February while the weather was nice and cool each day. Even I wouldn't have believed how quickly those plants were going to take off if I hadn't chronicled the growth in photos. Take photos People! It will encourage you unexpectedly! I first posted the progress on my Hoe and Shovel Facebook page (don't forget to click over and hit the LIKE button to join in the conversation). I didn't want to leave those of you who don't have a Facebook account out so here it is again just for you. The top photo was taken February 18 and the bottom photo only a short month later on March 23. So, what's going on within that new bed? Rattlesnake pole beans from Baker Creek Seeds are twining up the obelisk so sweetly... just like I saw it in my minds' eye before I ever started this project. I wanted this bed to be a mix of flowers and edibles. That's the way my 'designated' edible garden works also. But this bed is smack dab in the back garden. I wanted to smell it and see it while milling about that area. Is there anything more refreshing than the scent of fresh herbs and edibles growing? Another goal for this space was to create enough new plot that squash plants were sure to get enough air ventilation and sprawl space. 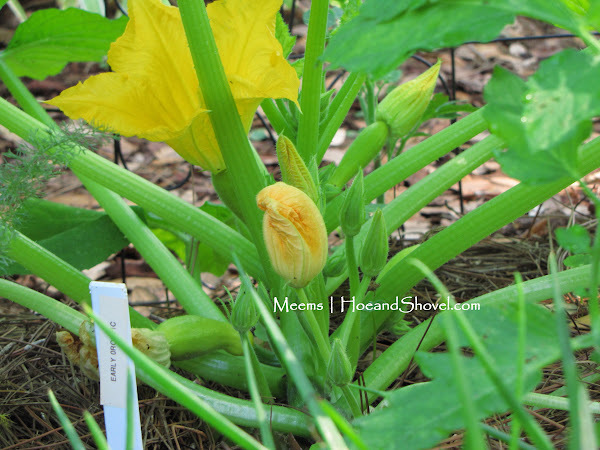 I've grown squash successfully in the edible garden but because the fall garden lasted so long this season space was limited when it was time to plant spring seeds. I'm pretty quick to solve those kinds of problems... just make more beds when I want to plant something. In this space the squash plants have some relief from the heat with late afternoon shade. Almost everything in this new bed was planted from seed or divisions or transplants from other places in my garden. 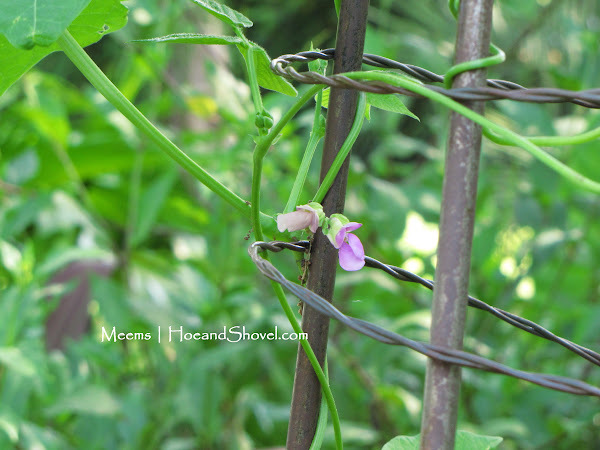 Sweet peas (seed from Renee's Garden) that sprouted but it must be too hot because they are not doing great. ... and the dollar weed is free. Ugh. I envy you all that space. I have space, but I also have deer. 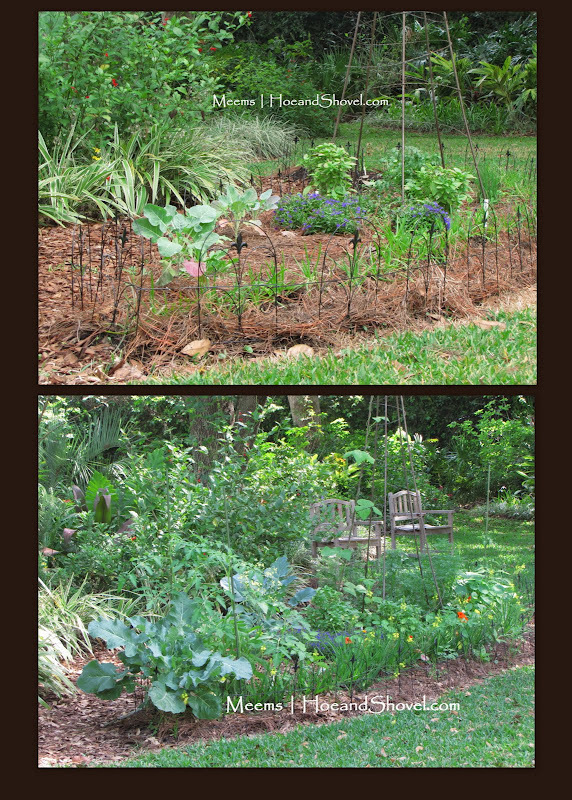 The fenced areas are not so big, and except for the veggie garden, has a lot of shade. I am building more beds, though. I just have to be careful with what goes in there. Great photos of progress in your gardens. I do believe summer is here already, winter was almost non-existant, and spring was here and now already gone. You have some beautiful plants and you are great at photographing them. Wow - just one month! I didn't think squash would work there for you at this time of year - doesn't it get powdery mildew? I keep an eye on what you do now so that I can do the same thing at the end of our "winter" I don't know what I would have done without my blog to refer back to for inspiration! that looks like a lovely spot to sit in the shade and contemplate! Absolutely wonderful I love your pictures of your garden.... Your blog is very inspiring and it makes me want to add more beds .. I love mixing flower and herbs and vegetables together too ! Looks great as ever Meems. You must have been busy with all that planting. What? Goodbye grass? Will you have only a walkway left when you're done? That is nothing short of amazing, Meems. Enjoy the rain this weekend! 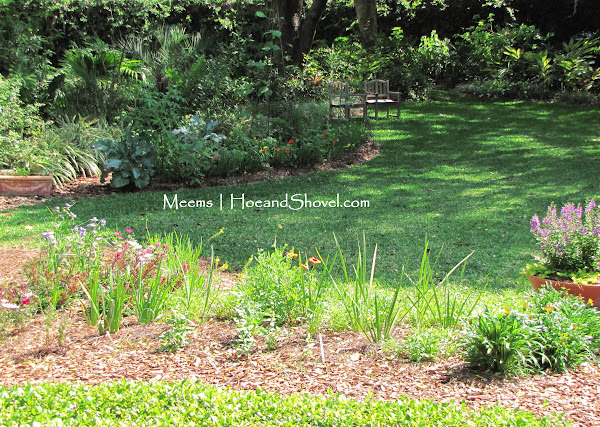 I am always amazed at how fast your new planting beds fill in and blend with the rest of the more mature garden areas. I'm still waiting on some of mine:) Gotta' be all that good soil you have. I really like your idea of blending flowers and veggies. Beautiful as always! 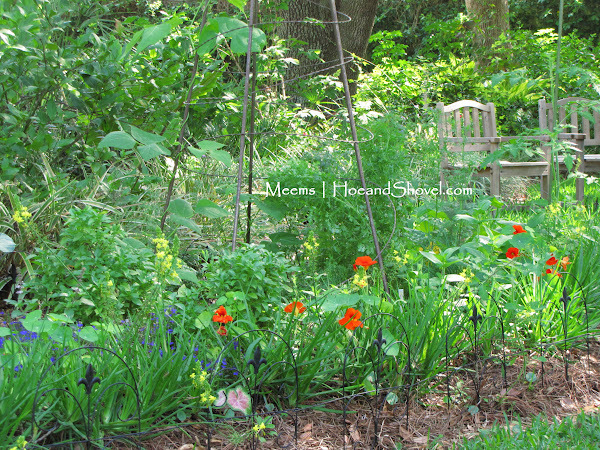 Did you plant your nasturtium seeds directly in the ground? I have started some from seed but in little pots to transplant. I am so inspired by your veggies..I have some in pots on my screen porch..afraid to plant outside due to bugs. Will you be at the USF sale this coming weekend? Hope to see you there!